The Food and Agriculture Organization of the United Nations (FAO) has named the IITA Youth in Agribusiness (IYA) program as one of the 20 Success Stories of Agricultural Innovation from around the world. These were profiled at the first International Symposium on Agricultural Innovation for Family Farmers, which took place in Rome, Italy between 21 and 23 November. Part of the IITA Youth in Agribusiness display at the Innovation Fair in Rome, Italy. The theme of the symposium focused on unlocking the potential of agricultural innovations in achieving the Sustainable Development Goals as stated by the United Nations. One of its objectives was the celebration of these innovations and their innovators, which was achieved through an Innovation Fair that showcased the selected 20 success stories. 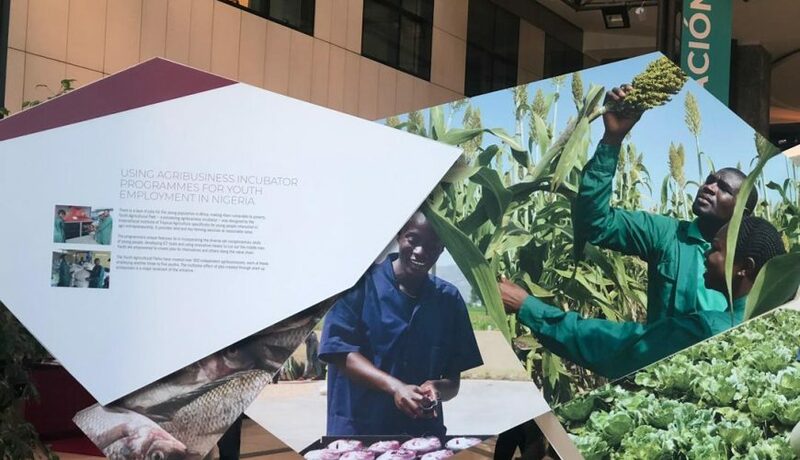 The featured success stories all involved agricultural innovation that addresses key challenges such as climate change, sustainable natural resource management, food insecurity, and hidden hunger, and unemployment, especially among youth. The Fair also provided a unique space to explore key questions and issues on agricultural innovation around the world. IYA was recognized for its incubation program for young people and for resuscitating abandoned agricultural facilities to train youth and establish pilot agribusiness enterprises. This has been a driver for youth employment across sub-Saharan Africa as well as providing the foundation upon which other youth engagement and empowerment programs have been built. See the Innovation Fair booklet for more on IYA’s initiative on agricultural parks.